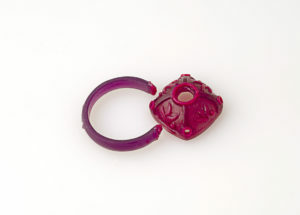 Lost wax casting is a technology that has been used for thousands of years dating back to approximately 3700 BC. Prior to the casting process, I begin with a basic counter sketch which is an omniscient view of the piece. After mapping the elevation, relief and figuring the exact math needed for the art model, the sculpting process begins. Special color related formulas of oil based wax are used in order to achieve the soft organic lines or crisp architectural corners. Simple carving tools and a heat source such as a candle or alcohol lamp are essential for this process. Some people like to get a hard wax and carve it, while others like a very soft wax they can shape with their fingers. I use an in-between method. I use an inexpensive alcohol lamp to heat sheets or wires of wax until they are malleable. I make a basic shape and then attach other bits of wax, using the alcohol lamp to partially melt them so they will hold together. I use wax carving tools that are like old fashioned dental tools to help shape and to add texture and detail. I like to polish the wax models with a fine old nylon sock to remove any remaining crumbs. Once the wax model is finished, I present the staged the wax with the gemstones to my customer so they have a live, tangible model to hold or try on. Once the final details in the wax are altered to my customer’s liking, I remove all gemstones, clean up the soft wax used for staging, and carefully package the wax model for transporting to the casting foundry. I do not cast my own models, but leave this process to the professional casting staff in Seattle. Lost wax casting is purely technical and scientific. The heavy gauge metal flask is basically a very sturdy tube with a removable end cap. Once the wax model is secured inside they pour in the casting investment, which is a kind of plaster. When the plaster hardens the flask is placed into a kiln so that the heat will melt out all the wax. When the wax is gone, there is a negative image of my model left in the plaster. The flask that now has the negative image of my model surrounded by plaster on one end of the arm of a spring driven centrifuge casting machine. The crucible is then filled with bits of white or yellow gold casting grain on the other end of the casting machine arm. Next, the oxyacetylene torch is used to melt the casting grain, the catch is released on the spring driven centrifuge arm. After allowing a little time for the metal to cool and harden, the flask is removed and placed in a bucket of water to dissolve the plaster. Now I have a rough gold casting of my wax model. Once the rough casting is produced, a flex shaft and a tumbler is used to turn my rough casting into the start of a beautiful piece of art. Lots of polishing and attention detail are required when cleaning and polishing tiny bezels before the gemstones and diamonds are set in their permanent settings. The joy and satisfaction of showcasing the final product is rewarding and feeds my inspiration of creativity.